Young Albert enlists to serve in WWI after his beloved horse, Joey, is sold to the cavalry. Albert’s hopeful journey takes him out of England and across Europe as the war rages on. Despite the official synopsis, WAR HORSE is about the journey of the horse, Joey, rather than that of his owner, Albert Narracott (Irvine). The tale begins in rural Devon, on the eve of the Great War. Young Albert is a farmer’s son and he comes to own Joey through a series of miscalculations made by his proud father Ted Narracott (Mullan). Another bad decision by Ted leads to Joey’s being sold to the Cavalry. Albert is heartbroken and he determines that he will find a way to get his beloved horse back. From here, we follow Joey from owner to owner, through the four years of the Great War. There are vivid characters and great set pieces. The war and its effects are presented in a way that is mindful of the younger members of the audience, but it doesn’t feel sanitised. There is no blood evident, but the trenches of the Western Front are shown as frightening, filthy and claustrophobic. The movie is based on a children’s novel by Michael Morpurgo which was later adapted into an award winning stage play. The screenplay is written by Richard Curtis (LOVE ACTUALLY) and Lee Hall (BILLY ELLIOT). Spielberg has taken this material and created a curiously non-Spielbergian movie. Stylistically, it is reminiscent of golden age films like GONE WITH THE WIND (1939). Its treatment of the story harks back to classic movies like LASSIE COME HOME (1943), NATIONAL VELVET (1944) and THE YEARLING (1946). It is a consciously old-fashioned entertainment unfolding over more than two hours. Although I wasn’t bored at any point, the 146 minute length may be too much for some younger viewers. This and the subject matter made me wonder whether WAR HORSE might be most suitable for horsey kids or your more thoughtful, bookish child. Hard to say. Certainly Abraham, the horse that plays Joey, is a beautiful and charismatic lead and he alone will keep plenty of audience members glued to their seats. Human performances are as solid as expected. Jeremy Irvine and Peter Mullan are good as son and father Narracott respectively, but Emily Watson shines as Rose Narracott, wife of the headstrong Ted. We see too little of the excellent Tom Hiddleston as Captain Nicholls the officer who buys Joey for the Cavalry. David Kross who played the boy in THE READER (2008) is a welcome addition to the cast as a young German soldier called Gunther. My slight reservation about WAR HORSE is that the essentially “batton-passing” nature of the story where we have to follow a succession of human characters makes it a little more challenging to get emotionally involved in the film – especially if you aren’t fully bonded with the character of Joey. 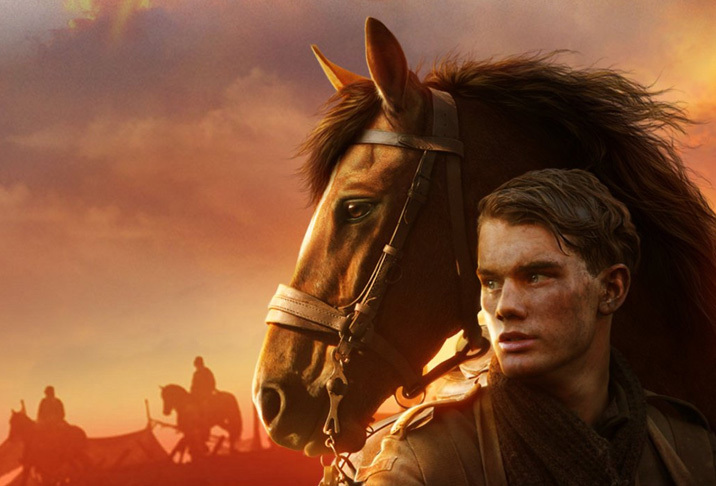 WAR HORSE is an intelligently made, high budget, beautifully shot film. It has a top-notch international cast and beautifully detailed production design. This is a quality picture that will satisfy audiences who want to immerse themselves in an historical tale. I rated WAR HORSE 7/10. SIDENOTE: There is an excellent episode of ABC TV’s AUSTRALIAN STORY – “Under Her Spell” that documents the engrossing tale of Zellie Bullen the woman who trained Abraham for WAR HORSE.